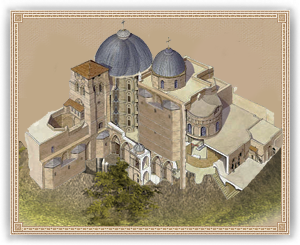 The Church of the Holy Sepulchre, or as it is known in the orthodox church, the Church of the Ressurection, is situated on the Hill of Calvary where Christ was crucified. Builit in 325 by the order of Constantine I, destroyed by Al-Hakim bi-Amr Allah in 1009, and rebuilt by the order of Constantine VIII in 1028, this holy site is a a place of true worship and pilgrimage for the christian faith. While happy to have this wonderous site within their city, and the wealth from pilgrims, the influx of people places quiet a demand on facilities.